This DIY Door Draft Stopper Project Takes About 10 Minutes And Costs Zero $! The weather has been crazy cold this winter, hasn’t it? NOT my idea of fun! 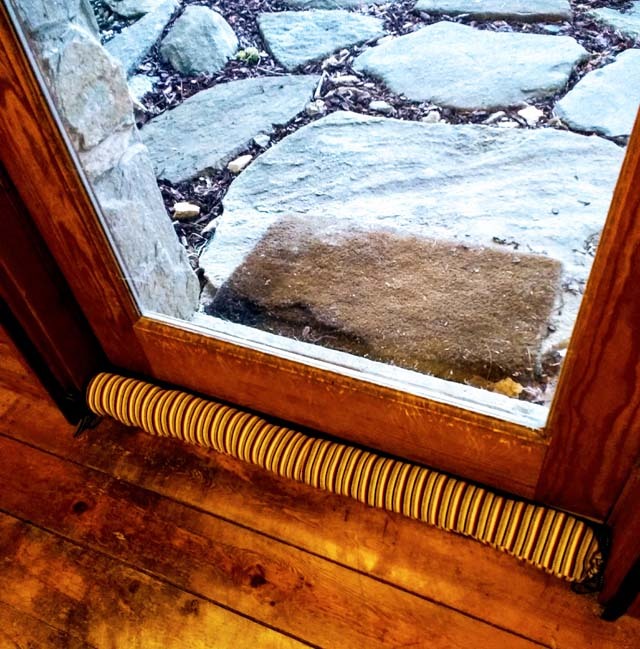 But recently I recalled my mother teaching me how to make a fun door draft stopper as a kid, and I thought I’d share this project with those of you who, like us, are currently freezing their buns off. When it’s bitterly cold like it is right now, nasty drafts seem to spring up everywhere in our house, but particularly under our doors. Every exterior door in our house seems to let the cold right in, which plays havoc with our efforts to stay toasty. But if you can sew a simple straight seam, you’re in luck. Here’s a really cheap weather-proofing project that will save you money and keep you occupied when you’re stuck indoors during a sudden cold snap. 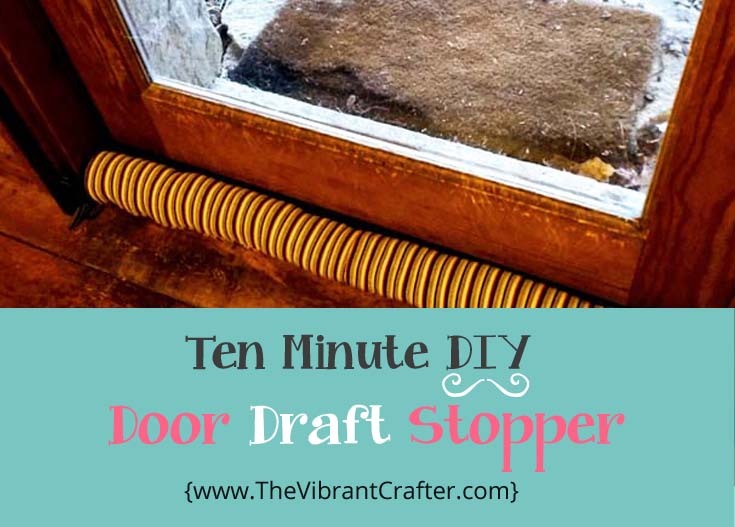 Here’s how to make a nifty door draft stopper, or draft blocker as some people call them. I’ve even heard them called a door draft excluder. Whatever works for you. When I was a kid living in chilly Wales in the United Kingdom we used to call them “sausages” or “snakes”. Either way, they keep the cold out and the warm in, and you can make this one for free. If you’re a mom or a teacher you could also make this a project to do with kids. That’s how easy it is. They can give them away as hand-made gifts to family members or even to shelters or old folks homes. Keep in mind if you don’t have a sewing machine you can make this door draft stopper very easily by hand just using a simple running stitch, or over-stitch if you’re using a sweater. But all bets are off on it being a 10 minute project. You’re looking at about 40 minutes to an hour in that case. An old long-sleeved top – a tee shirt or a not-too-thick sweater or cardigan. Something that your sewing machine can easily handle. A sewing machine or sewing needle. A length of ribbon for the ends – about a yard or a little less. Whatever you’ve got lying around your house. Shoelaces would work. Measure the bottom of your door, and add about 2 inches each side. So if your door is 36″ wide, you’re looking at 40″. Cut the sleeves off of your garment. Put them end-end to make sure they will fit the width of your door when sewn together. Basically, you want to go with the width of the cuff of the sleeve. So if your sleeve is 6″ wide, go with that. Mine was 4″ wide and it worked out fine. Sleeves get wider as they go up the arm, and you want your draft excluder to be the same size all the way along. So you’ll need to trim off the excess fabric (see the middle image above) to ensure that each sleeve is the same width as the cuff end. Next, open up the cut end of the sleeves and place them right sides together. Sew them together. Then sew along the outside edge, matching the seam in the middle. Now turn your draft blocker right sides out, so that it’s a big long empty tube-shaped thingy. Next, cut two tiny slits either side of the seam of the cuff of your top. Take a safety pin and push it through the end of your ribbon. Close the safety pin and thread the ribbon through the tube of the hem to the other side. Remove the safety pin. If you’re using a sweater, this step is even easier. Simply tie the ribbon around the ends like a British Christmas cracker and pull tight. Ta-da! Start stuffing it with some Polyfill stuffing (which is 100% recycled so I love it. I always keep a giant bag of Polyfill Premium Fiber in my house). Once you’ve stuffed your draft stopper to a perfect blend of not too lumpy and not too squishy, simply tighten your ribbons and tie a bow. Or a knot if your are not a bow kind of person. Or you can hide the ends inside your sausage – or snake – or Wiener dog. Either way. Now, if you have kids, this is the point where you can add some silly eyes, ears and maybe a tongue. Have fun with it – why not? Or keep it simple. Wherever your creativity takes you. Mine was kind of simple as it was a gift for a friend. These door draft stoppers are so simple and easy to make you can easily make one for every door in the house. You can use colors to coordinate with your decor if you have them, or find something cheap at a thrift shop if not. They even come in handy in very hot weather. When you’re running your air conditioning you can a draft excluder to keep the hot air out and the cool air in. If you like easy projects might also like my Instant Pot Cover Pattern blog. What do you think? Will you be making a door draft blocker (or more than one) this winter? Let me know in the comments below. P.S. Please feel free to share and pin this project. There are so many people out there right now who are feeling the bite of the bitter cold and this could make a big different to their comfort and well-being. P.S. You can also buy a pretty ready-made door draft stopper right here. P.P.S. If you haven’t gotten my 3 special gifts yet, pop over here to snag them.